Will we see Multy on October 17? Update: More evidence, including a leaked photo, has surfaced, making us increasingly confident that ZTE's soon-to-be-announce smartphone will indeed be the dual-screened Multy. Update: While most leaks provide nothing more than a blurry shot that inspires nothing but doubt, this one is the exact opposite. The device beautifully shown off in the above photo is supposedly the dual-screened Multy as we expected, according to Android Authority. It's certainly difficult to tell if what we're seeing is a product render or the real thing, given that the screens aren't powered on. However, we don't have long to wait until the October 17 event. ZTE has sent out invitations for an upcoming October 17 event in New York City at which it will unveil the next member of the Axon family of smartphones. Branching off from the excellent ZTE Axon 7, where could the brand go next? It’s possible that it could release another value-focused, feature-packed flagship. As we saw last year, ZTE has gotten very good at making those. But a recent leak spotted by VentureBeat points to a much stranger and potentially more interesting announcement: a dual-screen phone supposedly called the ZTE Axon Multy. If the leak is to be believed, the Multy will fold out into a 6.8-inch phone with its two screens aligned vertically, looking much like a small tablet device. It will reportedly run on the last-gen Snapdragon 820, pushing a modest 1080p resolution to each display. Other important specs to note are its rumored 4GB of RAM, 32GB of onboard storage and a 3,120mAh battery – a relatively low capacity even for powering just one screen. The event invite teases a large letter 'M' that’s split into two. Each side is doing something different, perhaps to indicate that the multi-screened phone is indeed coming. Given that the Multy is rumored to come with Snapdragon 820, it’s also likely that it will come with last year’s Android Nougat operating system, not the latest Android Oreo. However, split-window multi-tasking was introduced with Nougat, and the Multy could take the feature to a whole new level with its two screens. 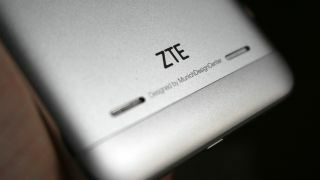 This new ZTE device is said to be launching as an AT&T exclusive in the US for $650, and while early signs don’t bode well for a global release, if it proves a hit it could get a wider rollout – and regardless, this is still a potentially significant launch given the innovative nature of the product.